Employing Python scripting allowed staff to go back and forth between conventional mapping and 3D modeling. 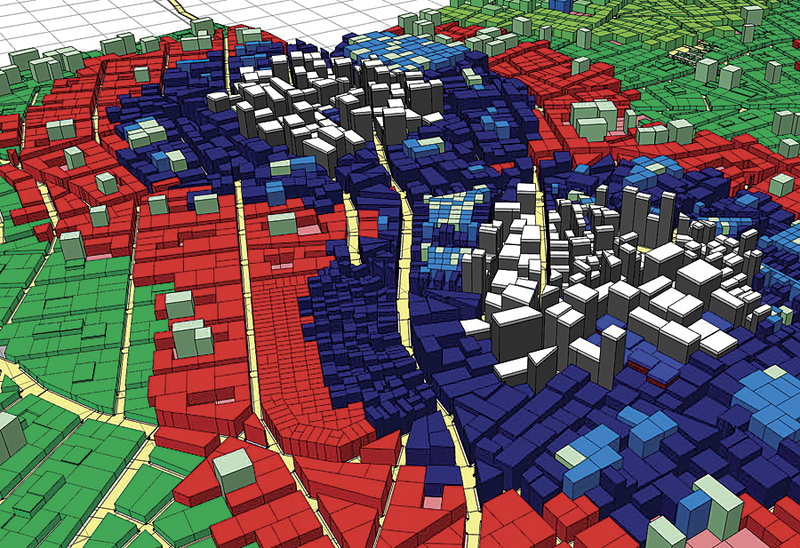 CityEngine goes beyond standard visualization into actual creation of data based on specific urban planning standards. Using CityEngine, 3D models from previous jobs were imported and their preexisting 3D assets and rule files put to use. This Nasiriyah display sheet for detailed study presents a proposal for a large shopping mall. Iraq has had a rough ride in recent times, and many of its cities are showing the scars of years of neglect and warfare. A lack of investment in basic infrastructure, combined with a brain drain of professionals, has left many Iraqi cities in a very poor state of repair and with limited plans for the future. But with the fall of the previous regime have come opportunities to revive and repair these aging and often historic cities. 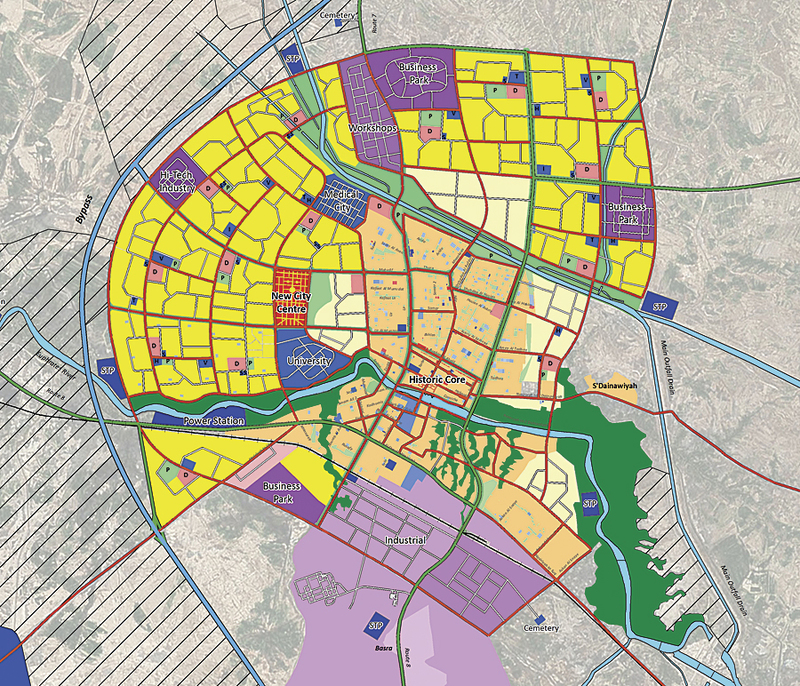 In 2007, the Iraqi Ministry of Municipalities and Public Works (MMPW) awarded a British firm, Garsdale Design Limited (GDL), and its Iraqi Planners Group (IPG) the contract to develop a master plan for the city of Nasiriyah in southern Iraq. The project was to deliver urban planning for the new dwellings, infrastructure, sewerage, water, and electric systems needed over the next 30 years. Nasiriyah is the capital of Dhi Qar province in Iraq. Almost 500,000 people call this city their home, located 225 miles southeast of Baghdad on the Euphrates River and close to the ancient city of Ur. Garsdale Design is a planning, architecture, and heritage consultancy based in Cumbria in the United Kingdom. It has extensive experience in the Middle East, and many of its projects have entailed urban design and city master planning in the Gulf Arab states. 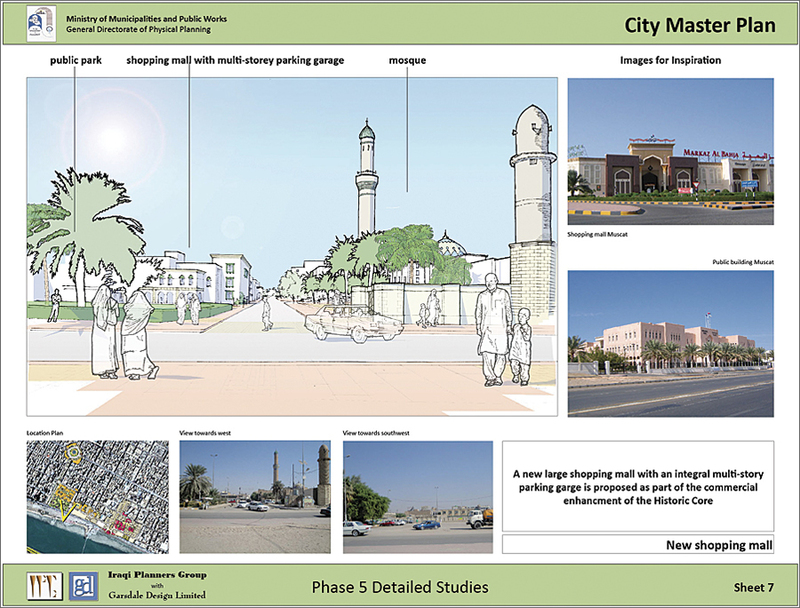 “Master planning any city is a complex task,” says Elliot Hartley, director of Garsdale Design, “but Iraq’s cities face huge additional challenges from lack of investment in infrastructure to training of planning departments.” Hartley manages and analyzes the spatial data that is required for planning projects like the Nasiriyah City Master Plan. The stages of any workflow are important, but it is the visualization of the small details that can have dramatic impact, such as the placement of palm trees. The staff at GDL focused on planning a contemporary community in Nasiriyah with an integrated public transport network that still reflects the culture and history of the almost 150-year-old city. The goal is to help the city grow sustainably over the next 30 years. The GDL team quickly realized that CityEngine could be part of the master planning process and not just a visualization tool. “Unfortunately, we can’t just jump into a new workflow in the middle of a project. This could have unacceptable impacts for us and our clients,” says Hartley. However, the company quickly learned that using CityEngine on elements of master planning projects helped to visualize where the pieces best fit. This is a typical Nasiriyah City Master Plan sheet. 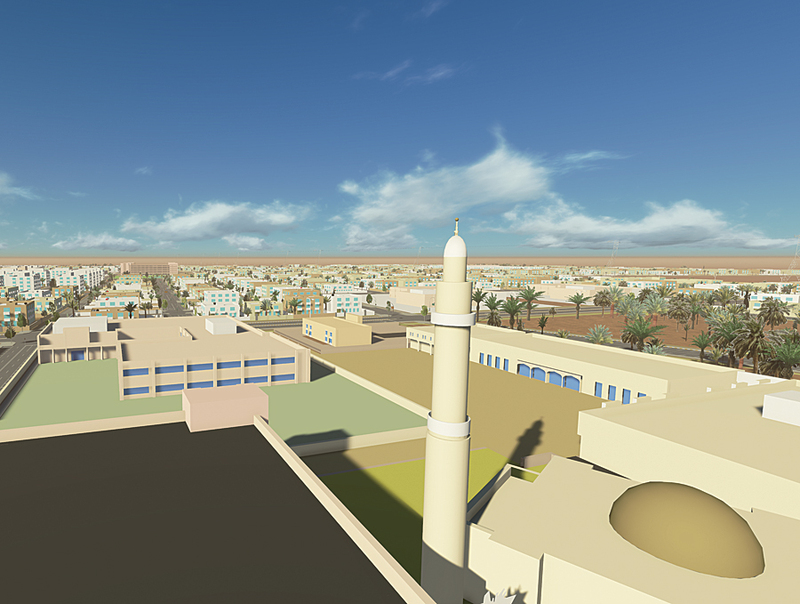 The first task performed with the 3D modeling software was building a new neighborhood with basic block models. Data from previous phases of the project was used to visualize elements of the master plan quickly in realistic 3D visualizations in just a matter of hours. “This would have taken many hours, if not days, to produce in-house using other 3D modeling packages,” says Hartley. Over the years, GDL has built up a stock of 3D models used for previous jobs that provide inspiration for current work. Using CityEngine, these models were imported and their preexisting 3D assets and rule files put to use, with a few quick adaptations. For example, staff employed a rule file that tests the size of a plot and places an appropriately sized building model accordingly. A specific set of vegetation models that included native trees was also used, with one tweak—existing tree rules were replaced with a new definition. Streets were then modeled with these trees—palm trees—and the trees were randomly inserted on lots to give a more natural look to the model. Employing Python scripting allowed staff members to go back and forth between the ArcGIS environment for conventional mapping and CityEngine for 3D modeling. For example, a street centerline was created in ArcGIS and then brought into CityEngine, where curbs, central medians, streetlamps, and trees were added in accordance with the rule file. The result was then exported back to ArcGIS for analysis and mapping. This data was then used to create plots and place building types according to the underlying land use in CityEngine, then brought back into ArcGIS for further analysis. Underlying data, such as relief or geology, can also be used. For example, a raster with a red color can be used to restrict development in particular areas, and elevations can be used to restrict building heights or types. Staff used the modeling rules they need for each individual project, no matter how general or detailed, so different issues can be modeled at either micro or macro scales. This is a simple demonstration of a density-based concept. What size of plot is needed within a particular land block? Can building height be varied to recognize the underlying geology? How can lots smaller than a certain size be shown as playgrounds within a residential area? What lane and sidewalk width is required for the different grades of roads? How wide should the central median be for higher-order roads? Can streetlamps be modeled differently to suit the various grades of road? Can buildings be modeled at different heights depending on how close they are to a center or transport node? For more information, contact Elliot Hartley, director of Garsdale Design Limited.